Submission of the OBDX project to the MOBI Grand Challenge in collaboration with NuCypher | Network, Information and Computer Security Lab. NICS Labs has suscesfully integrated NuCypher technology in the on-board device used in MOTAM project. In the OBDX project, the OBDII data from the vehicle is encrypt locally in the vehicle and sent over the air to any interesed party using the MQTT protocol. 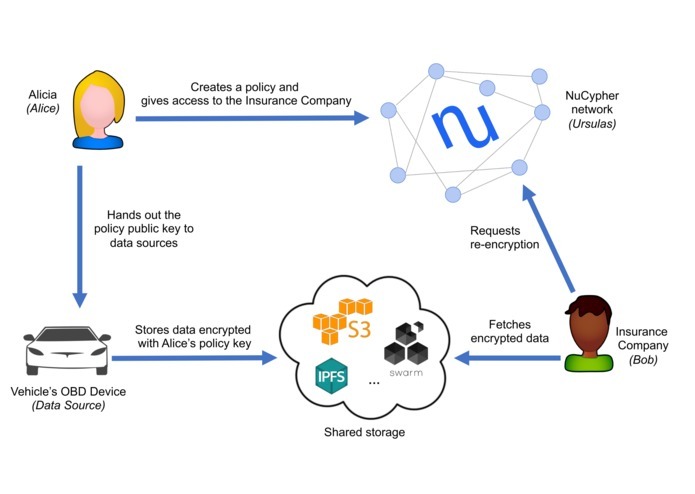 Any party willing to access the data can request Alice access to and use the NuCypher network to get access to the decrypted data. We have developed a script that is run in a Raspberry Pi connected to an ODBII device. The script reads data from the onboard diagnostic bus of the car and encrypt it directly using NuCypher libraries. We have also recorded a driving session around the Ada Byron research building in Malaga, Spain, that can be played back to see the code in action without the need for an actual OBDII device. The car service uses the MQTT protocol and the shiftr.io platform to communicate with all other parties and only needs the public key of the owner of the data, Alicia, to start sending the encrypted data. Each of Alicia’s OBD diagnostic values at a particular timestamp is encrypted using a symmetric key, and the symmetric key is encrypted using a policy public key. This data is pushed to MQTT and is then pulled by an Enrico subscriber to a database. When Bob wants to gain access to the sensor data, he must use nucypher’s network of proxies to re-encrypt each set of measurements (each row in the database) so that it is made decryptable by Bob’s private key, all without the data ever being decrypted or exposed to the proxy, as is typical for regular public key encryption.